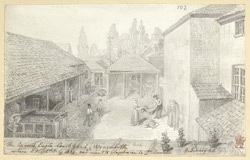 This atmospheric drawing depicts the backyard to the Spread Eagle Coaching Inn, Wandsworth. Wandsworth was mentioned in the Domesday Book as "Wandelesorde" or "Wendels-orde" meaning "village on the Wandle". Since the 1300's the area has been associated with industries such as millinery, ironmongery and cloth bleaching. The town's reputation for quality headwear grew over time and orders were soon received from the Cardinals of Rome. The Spread Eagle Inn was mostly rebuilt in the late 19th century when Wandsworth underwent a boom in the beer making industry. The pub has remained the property of the Young's Brewery since 1836. Many influential writers have lived at Wandsworth, including Daniel Defoe, Voltaire, Edward Gibbon and Thomas Thackeray.